This is my new favourite chocolate cupcake recipe. I have also used it successfully to make a layer cake. This recipe is very similar to the previous favourite chocolate cake recipe (see here), with the main difference being that this new recipe includes cornstarch. The difference in result is very subtle, but I’m convinced that the texture of these cupcakes is slightly better. 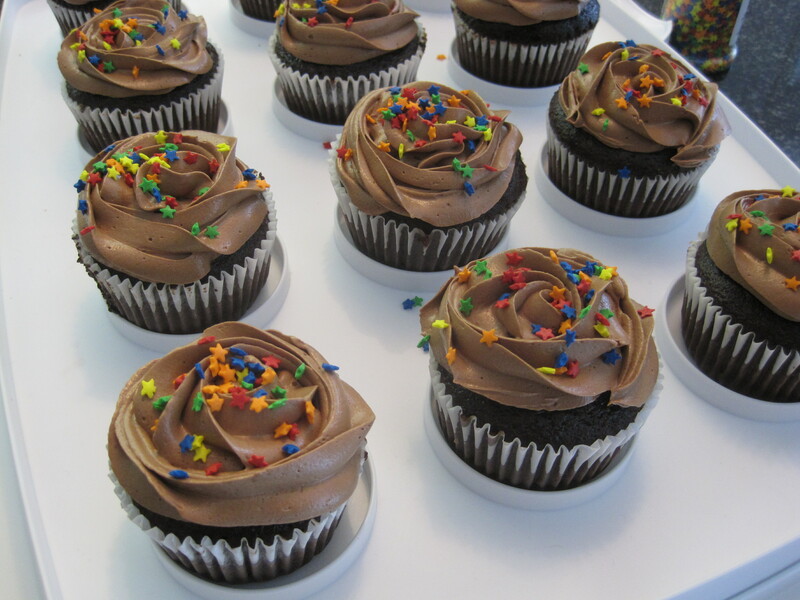 This nutella and chocolate frosting is also worth mentioning. I never knew that such a simple frosting could be so light in weight, smooth and delicate in flavour, and still hold its shape when piped. 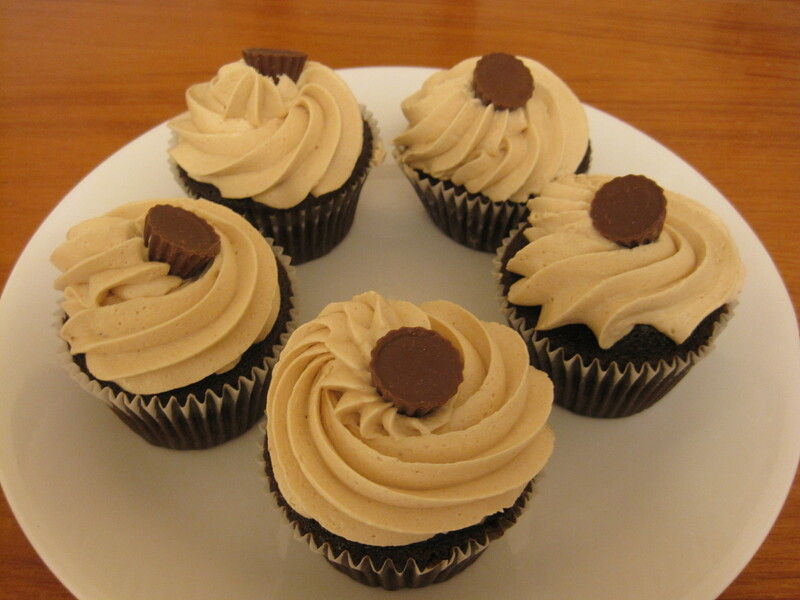 In fact, Sweetapolita calls it “nutella cloud frosting” to describe the texture. It is comparable to swiss meringue buttercream in heavenly texture but requires much less work, time, and ingredients. Note that I’ve also paired this chocolate cake recipe with a chocolate swiss meringue buttercream and it was incredible. See instructions here. Update: I discovered a similar chocolate cupcake recipe (see here) that I like a bit more than this one. The difference is very slight and the two recipes differ mainly in the ingredient, cornstarch. I still recommend this original favourite below, too, as it is delicious and has never failed me. I have tried many chocolate cake recipes, but this is only the second recipe that I have posted so far. Can you tell I’m picky when it comes to chocolate cake? 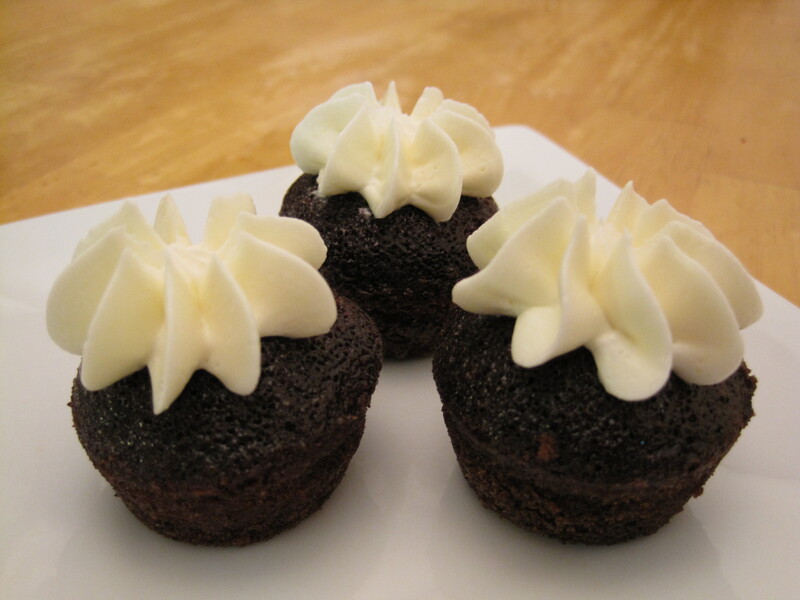 The first one posted is my favourite casual chocolate cake recipe that incorporates mayonnaise (recipe here). The recipe I’m sharing now uses buttermilk and vegetable oil and yields a fantastic chocolate cake that is very moist and chocolatey. Through recipe testing, I discovered that making cake with vegetable oil results in a better moistness than making cake with melted butter. This recipe is very quick and easy to make and I’ve used it successfully many times for cupcakes, mini cupcakes and even a wedding layer cake (see here). As a layer cake, this cake has the perfect texture; it isn’t too dense and it slices beautifully because it holds its shape well. 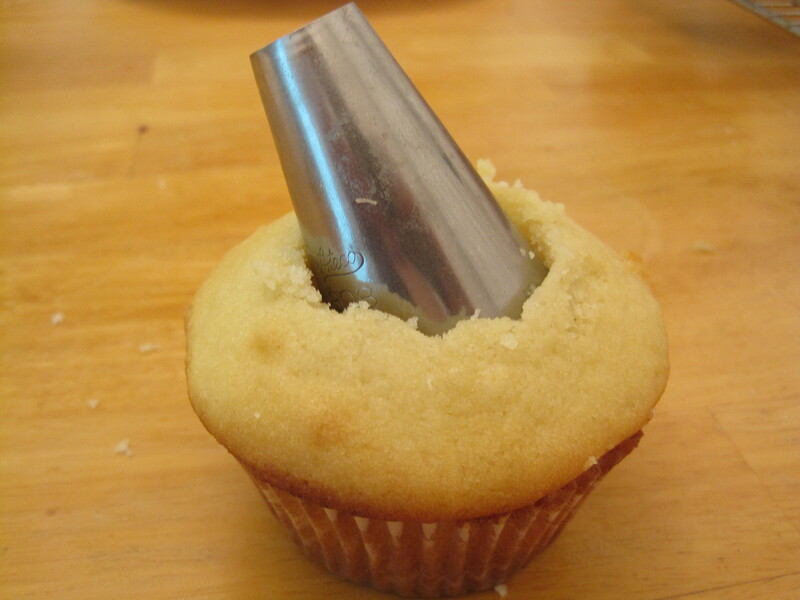 In my opinion, this recipe makes the best mini cupcakes. I made mini chocolate cupcakes with vanilla swiss meringue buttercream for coworkers to celebrate an engagement and everyone loved them. The compliments were endless and people loved the ratio of cake to frosting, so resist the temptation to frost your cupcakes too heavily. I’ve also included a recipe below for a simple, spreadable chocolate frosting if you don’t have the time or the ingredients to make swiss meringue buttercream. Update: I recently made a chocolate layer cake with chocolate swiss meringue buttercream and the chocolate swiss meringue buttercream was amazing. I highly recommend you try it. See here for instructions. In June 2011, I took Ed strawberry picking for his first time. The farm had arranged for someone to play the banjo in the fields while people picked fruit. It was a fun day until I realized how quickly our beautiful, fresh strawberries were becoming too ripe. Then there was a mad rush to use them all up. (See how I freeze strawberries here.) So I made two different types of strawberry cupcakes, a strawberry flavoured swiss meringue buttercream, and a frozen strawberry pie (recipe here). I had planned to make strawberry popsicles too, but ran out of steam. Freshly picked strawberries make a huge difference to the flavour of strawberry desserts. They also allow you to reduce the amount of sugar that you use. Please adjust the sugar content of the recipes below based on the tartness of your strawberries. When smitten kitchen claimed to have the best yellow cake recipe, I knew I had to try it. 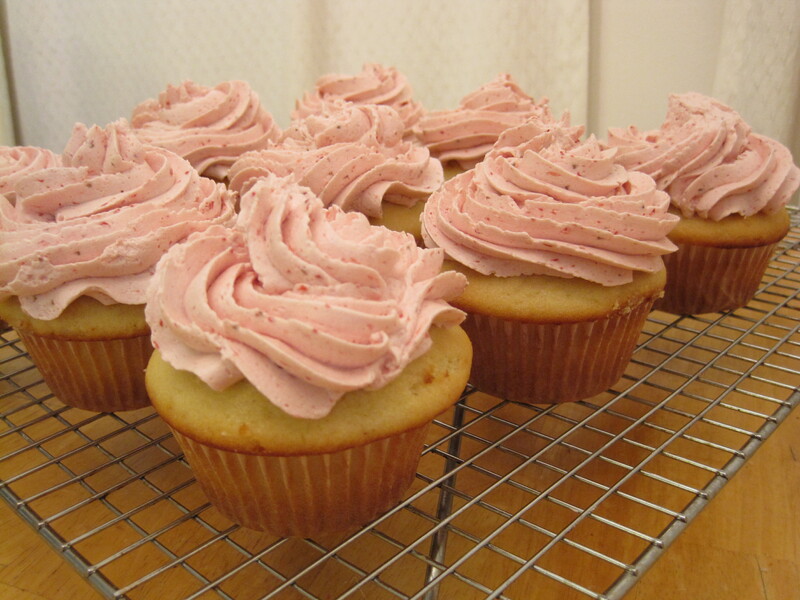 This is the perfect recipe to use for strawberry shortcake cupcakes (recipe here). It would also be great with a peanut butter icing and jam filling. When it comes to layer cakes, however, I prefer to use all purpose flour because I like cakes with a tighter crumb. 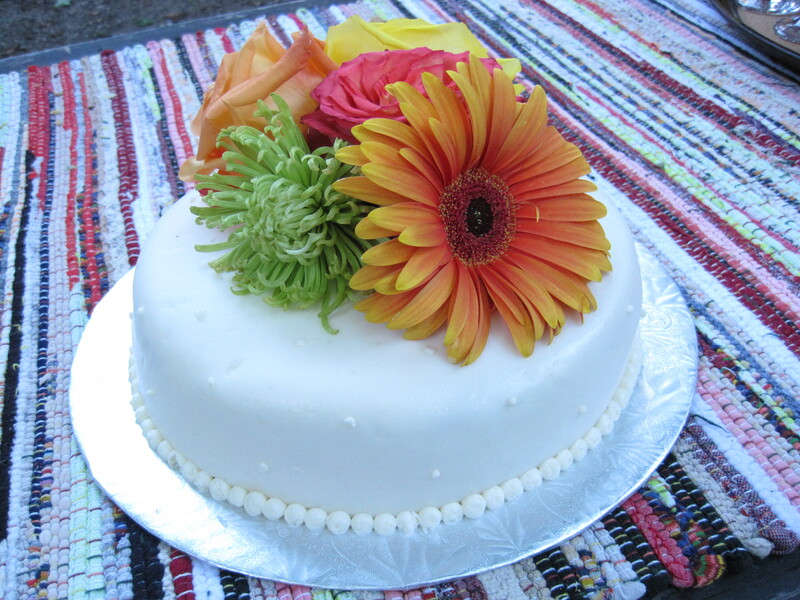 See my favourite yellow layer cake recipe here. 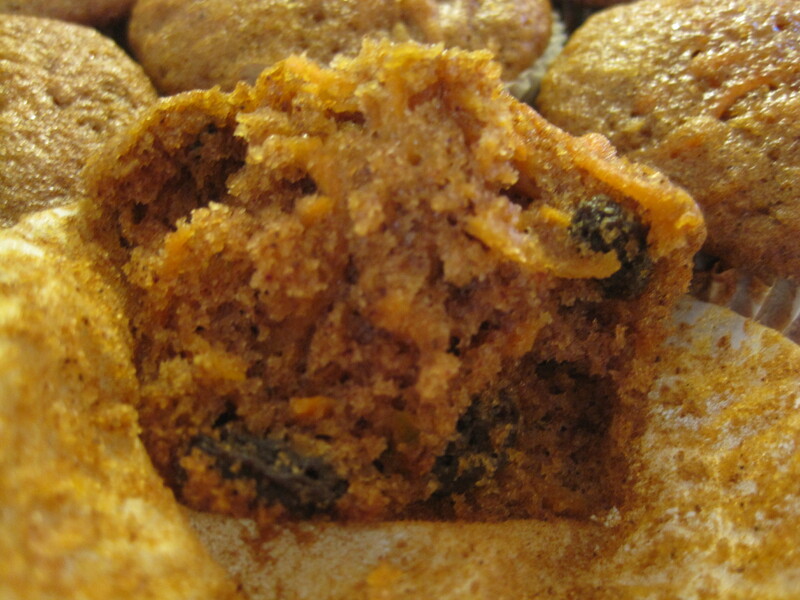 These carrot muffins are soft, moist, and not too sweet. The best part about these muffins is that no one will be able to tell that they were made with whole wheat flour. 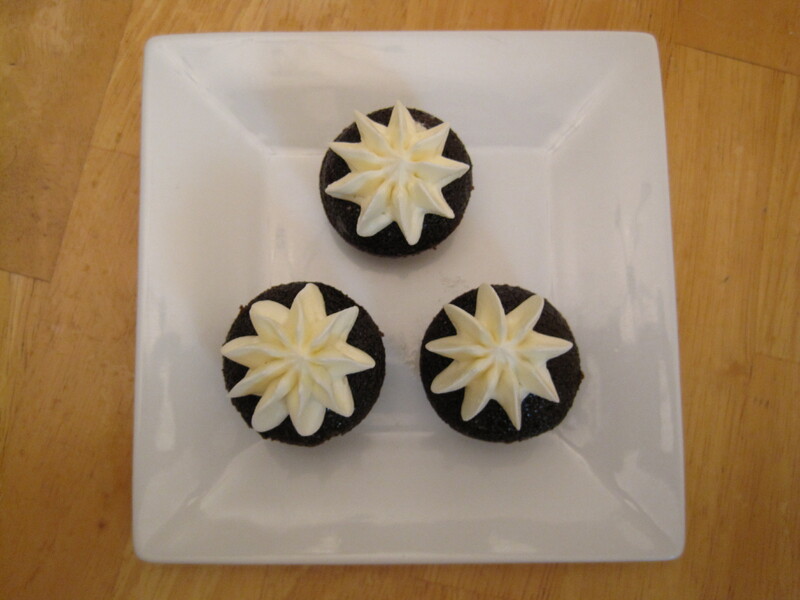 I made these for a friend’s birthday and added a cream cheese frosting. It was the perfect addition of sweetness. Everyone loved them and several people asked for the recipe. For these muffins/cupcakes, I prefer to casually spread a light cream cheese frosting over the top (I used the cream cheese frosting recipe posted here). However, if you prefer a heavier cream cheese frosting that will be stiff enough to pipe after chilling in the refrigerator, use the recipe posted here. I regret not taking a photo of the frosted carrot muffins/cupcakes. When I made mushroom ravioli (recipe here), I bought 2 containers of ricotta cheese but only used one. Not wanting to use it for the standard pasta dish, I searched the internet for new ideas and found lemon ricotta muffins. I tried two very highly rated recipes, tweaked my favourite of the two and made lemon curd to go with it. 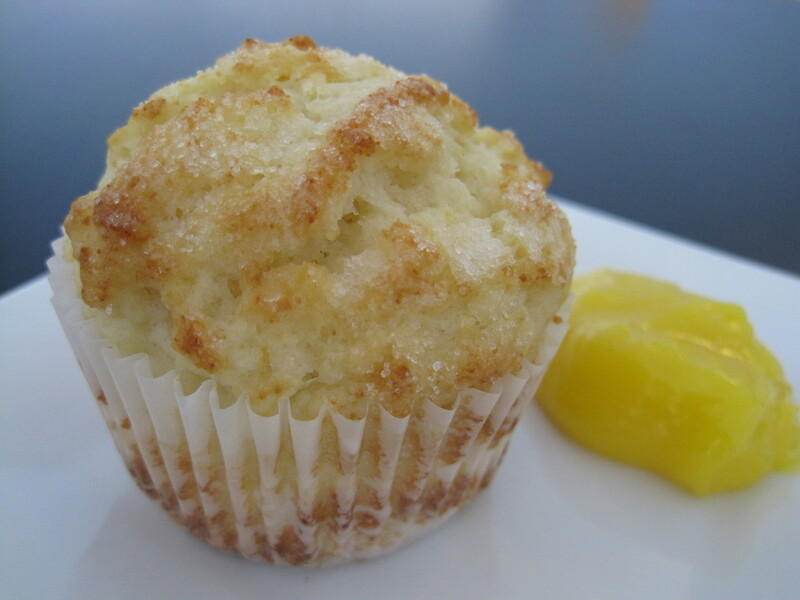 These muffins are light, lemony, and soft with just a hint of sweetness. They’re perfect for a summer picnic, bbq, or shower. 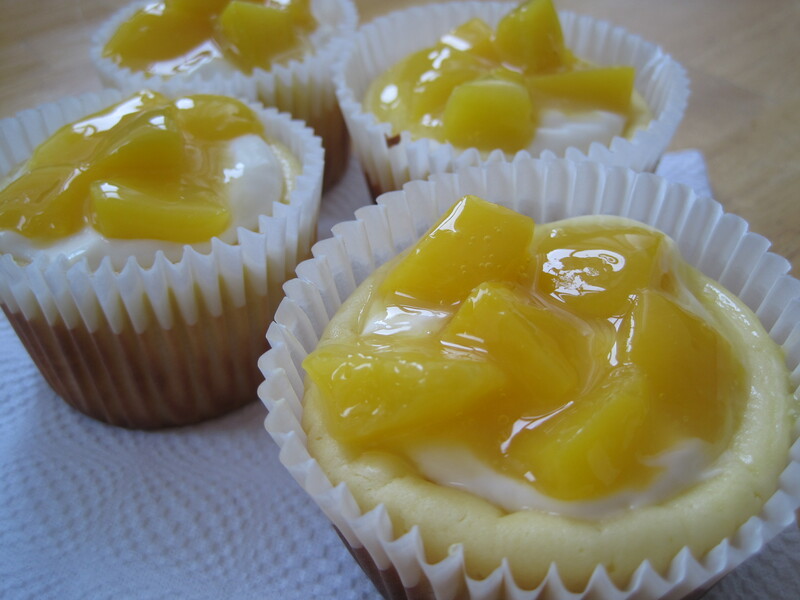 I first discovered the concept of cheesecake cupcakes when I made and fell head over heels in love with Peaches and Cream Cheesecake Cupcakes (recipe here). I love Hershey’s cookies and cream chocolate bars so when I saw these in Martha Stewart’s Cupcakes book, I knew I had to try them. I really like the crunchy cookie base. It’s the perfect contrast in texture to the smooth and creamy cheesecake on top. 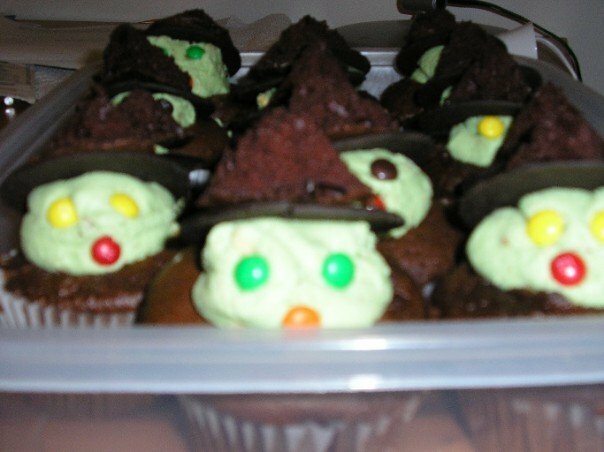 These are the best cupcakes I’ve ever made or eaten. 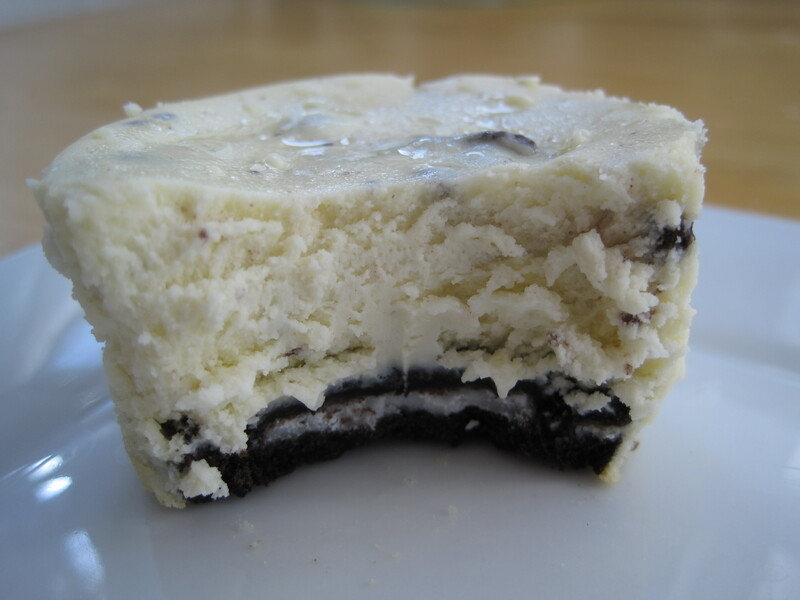 The cheesecake has the perfect texture/density and the toppings have the perfect touch of sweetness. 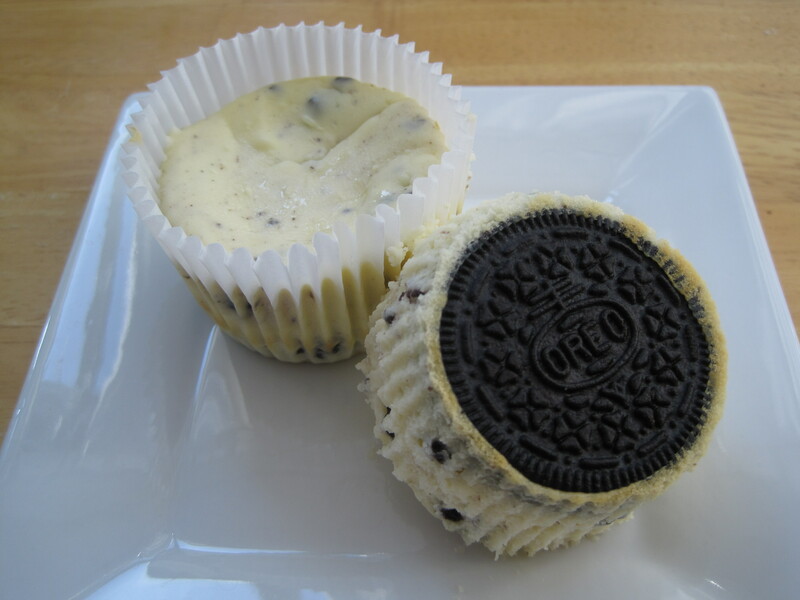 I don’t love cheesecake but I adore these cheesecake cupcakes. I made them for a bbq in the summer and people Loved them. I made them again recently for Ed’s mom’s birthday and they were a huge hit with them too. I ended up making these for my dad’s birthday shortly after that. It takes some time to make and needs to be refrigerated before serving, but it’s really really simple and definitely worth it.